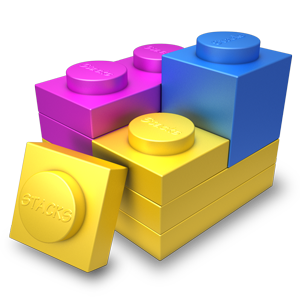 From the very first release of our Stacks plugin for RapidWeaver we’ve encouraged developers to build their own stacks with the Stacks API. With each release we’re blown away at what the stack developers create: from simple pragmatic one-liners, to massive frameworks with tens of thousands of lines of code, the stack developers are moving the platform forward. And that’s why each release of Stacks moves the API forward, giving developers more tools and more power. Stacks 3.5 aims to be a quantum leap for the API by giving developers dozens of new features, a huge speed boost with a brand new preprocessor, an encrypted security layer, and much more. Together they give developers the tools they’ll need for their next quantum leaps. All of these API upgrades are 100% free for existing users and 100% backwards-compatible for developers. That means developers can start building new features without worry, users can update immediately, and everyone can feel the benefits. So download and install or click install when the auto-update appears. It may seem like no big deal — it’s just a free point release after all. But don’t be fooled, it’s the start of the next big thing.